Intraspecific positive relationships between abundance and occupancy are observed for many species, suggesting that the same processes drive local and regional species dynamics. Two main groups of mechanisms explain this relationship: spatiotemporal variation in local population growth rates due to variation in habitat quality, or dispersal effects that increase occupancy of a species when locally abundant. Several studies show that spatiotemporal variation in population growth rates causes positive abundance–occupancy relationships, but few have shown dispersal effects. It is believed that such effects should be more evident for species whose dispersal is limited, e.g. metapopulations, but those studies are limited. This study investigates abundance–occupancy relationships in three Daphnia metapopulations in rock pools and the degree to which dispersal or habitat quality affect their local abundances and occurrence. Daphnia longispina and Daphnia magna showed positive abundance–occupancy relationships, but not Daphnia pulex. No single ecological factor could explain the abundance–occupancy relationships of any given species. Instead, dispersal processes and rock pool quality (mainly salinity and depth) seem to act together to shape the abundance–occupancy relationships. Such a conclusion is also supported by an immigration experiment in natural rock pools. This study suggests that although positive abundance–occupancy relationships may be commonly found for metapopulations, both dispersal processes and variation in habitat quality can be factors determining the abundance–occupancy relationship of metapopulations experiencing habitat heterogeneity. The online version of this article (doi: 10.1007/s00442-010-1752-8) contains supplementary material, which is available to authorized users. 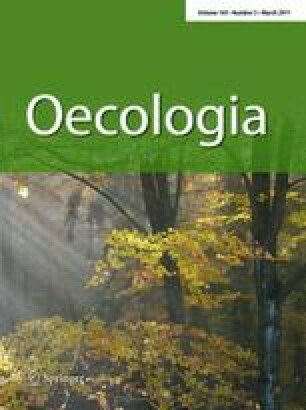 I am grateful to the handling editor of Oecologia, two anonymous referees, and Anna Gårdmark for their suggestions for improvements on earlier versions of this manuscript. This study was financed by the Swedish Research Council (VR).